SAP S/4HANA Cloud has landed. As we begin to look at how to architect, integrate and deploy cloud ERP with customers, this article explores some of the options on the table. The question we want to address is how do these offerings integrate to on-premise, be it SAP ERP Central Component, SAP S/4HANA or third-parties? What about integration to other SAP cloud solutions such as SAP SuccessFactors, SAP Ariba, and SAP Hybris Marketing? In a nutshell, stay cutting edge to maximise the potential and readiness for innovations. SAP S/4HANA Cloud can rapidly accelerate business value via agile delivery, create tight integration within a customers’ landscape, applies a fit to best practice methodology and also provides support for extensibility at platform level via SAP HANA Cloud Platform. In business terms, these features translate into flexibility and speed. With a cloud solution running on the same data model as the on-premise solution, you can integrate new departments within an organisation into the ERP landscape. It also becomes possible to on-board new entities that have been acquired through a merger or acquisition. Or you could roll out an enterprise-ready ERP solution to subsidiaries within the organisation and you can achieve any of these scenarios without the overhead of a big-bang approach, or the long timescales of implementing a full on-premise ERP solution at each subsidiary. How do you transition on-premise ERP to SAP S/4HANA Cloud? The following scenarios outline the options. This approach seems fairly clear; a requirement is identified to implement SAP S/4HANA Cloud for a specific solution, such as finance. You can create a trial landscape with minimal time and effort and have a deployed production ready solution within 8-12 weeks. The business outcome? Simplification based on ready-to-run business processes, best practices available with guided configuration, reduced time to value, and TCO, leading to more time to focus on innovation. The other approach is two-tier ERP. SAP S/4HANA Cloud recognizes the need for synchronization between headquarters and subsidiaries that preserves local autonomy and support for local business processes and requirements. This approach addresses common challenges within ever changing organizational structures such as mergers & acquisitions and strategic partnerships & outsourcing. 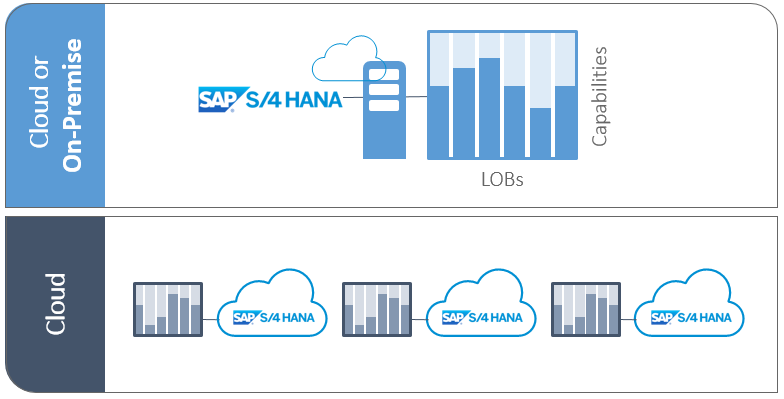 SAP S/4HANA Cloud leverages a consistent code line and data structure extending from a fully-functional headquarters system running SAP S/4HANA on-premise to a flexible and adaptive subsidiary solution, also based on SAP S/4HANA, running in a public cloud. Leveraging SAP HANA Cloud Platform further extends this model by providing a platform for additional functionality. This includes direct connectivity to other SAP cloud assets, such as SAP Ariba, SAP SuccessFactors, SAP Hybris, and Concur. It also provides a platform for building net-new functionality. The ability to use the same product family, with its shared data structures, APIs, and extensibility platform in a two-tier deployment, makes it possible to support a high degree of operational integration between headquarters and subsidiary operations without sacrificing the autonomy and local requirements that are sacrosanct in many subsidiaries. SAPs two-tier approach allows customers to adopt new innovations at their own pace, without disruption to the business. Transitioning to SAP S/4HANA Cloud shouldn’t be seen as an overhead. SAP has a proven methodology and services to ensure business value is realized in a timely manner. It does so through an extensible framework and with the adoption of best practices to fit to standard. This approach drives accelerated time-to-value and reduced total-cost-of-ownership. Have you started planning your journey to SAP S/4HANA Cloud? What are your questions or concerns? I’d love to hear from you. Our experts are ready to support your path to innovation.